A story that has been making the rounds on blogs and news websites this week is the Digital Iron Age Environment, a project by Swedish game developer Daniel Westergren. I came across Daniel’s interview with Digital Digging, where he describes his investment in accurately recreating the landscape of Iron Age Uppsala, in eastern Sweden. He uses the CryEngine 3 technology to power this visualization, displaying his attention to detail, while at the same time adding subjective touches on top of the real archaeological data behind his interpretation of Uppsala’s past. People with a passing knowledge of modern videogames will recognize the engine and its predecessors as being behind some of the most realistic gaming graphics in recent years. 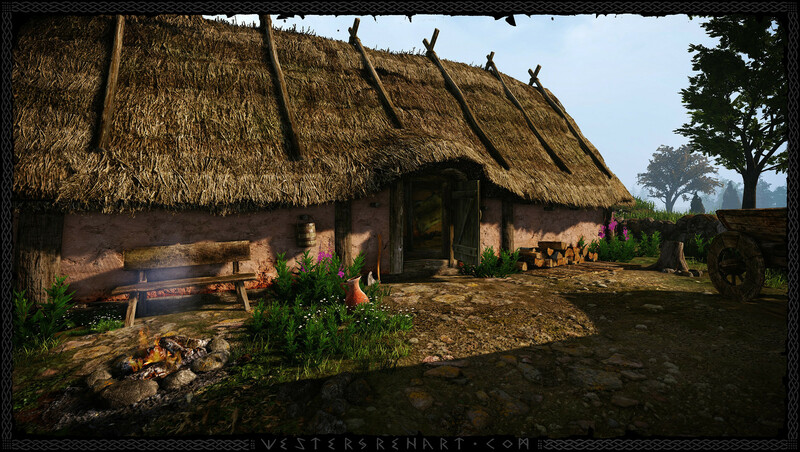 A reconstruction of an Iron Age house in CryEngine. Westergren’s project piqued my interest for a variety of reasons. Firstly, the project comes across as a labour of love by an artist seeking to faithfully depict his country’s heritage, albeit through his own interpretative process. Although he makes extensive use of information generated by archaeological research, at the same time he acknowledges the limitations of our fragmentary data. This makes him free to use it as a source of inspiration to create his vision of what the Iron Age landscape was like. At present, there appears to be very little room for interaction between the user and the world. This gives the environment the quality of being a hyper-realistic digital theme park. The flora, fauna and landscape can be seen and traversed, respectively, but not directly handled or used. Water flows, wind blows and the sun shines, all in glorious high-definition graphics that the average desktop PC would struggle to display in full detail. The user is, however, an observer rather than an actor in the world. In light of this, I find it worthwhile to compare the Digital Iron Age Environment with a conceptually similar, but considerably more low-fi project. From across the Gulf of Bothnia, UnReal World is a free videogame (first release 1992) about survival in the late Iron Age of northern Finland. First, one must note that it is undoubtedly meant to be a gaming experience. There are a variety of systems in place to simulate the experience of being a person in this time and place (including Fennoscandian folklore) that introduce a thick layer of abstraction. Numbers represent everything from factors such as the user’s level of health, to the nutrition one gets from eating wheat, to the sudden appearance of bad weather. Rather than being sculpted by the artist based on archaeological data, as in the Uppsala project, this world is randomly generated given certain parameters. 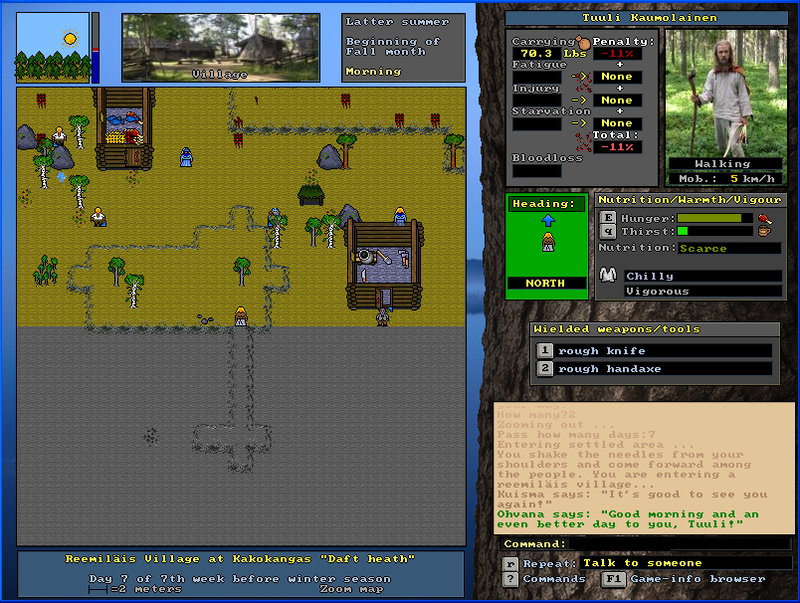 The overall focus of the experience is one of survival against the odds, which is typical of the ‘roguelike’ genre it is part of. The player who enters this world, however, is free to do almost anything. Hunting, skinning, trapping, farming, smelting, trade and much more are all present and accounted for. This lends the world a depth and level of authenticity that gives the incredible visual detail of the Uppsala project a real run for its money. UnReal World’s creator, Sami Maaranen, at one point distributed it to public libraries as a teaching tool, in an obvious Fennoscandian parallel to the famous Oregon Trail educational game series in North America. Taking into account some very important caveats, for example the level of abstraction, the randomized 2D representation of the world, the subjectivity of the creator and the presence of anachronistic elements (e.g. allowing the player to acquire crossbows), UnReal World is probably the most accurate interactive simulation of life in the European Iron Age that exists. Although not situated in the exact same time and place, the contrasts and similarities between these two digital experiences are interesting because of the different ways in which they represent the past. One is a reconstruction of a specific landscape in a specific era, drawing on some very concrete archaeological evidence from across Scandinavia. The other is not tied to a geographic location more precise than the vast north of Finland, but presents itself as a reasonably accurate simulator of living in the Iron Age, given its assumptions and idiosyncrasies. I would argue that both worlds can function as narrative tools for presenting certain perspectives on the past, and it is very encouraging that both authors of these digital worlds claim to be inspired by, and attempt to be faithful to, real historical and archaeological data. As an aside, the Gamla Uppsala project, which Westergren mentions as a source, also creates 3D visualizations of their excavations. Check out the links throughout this post for more media and downloads related to these ongoing projects!